All in 1 is a clean and beautiful, responsive design PSD site template suitable for Creative, Corporate, Company Page, Fashion, Gallery Photo Site, Portfolio, Personal page, Online Shop, Small Business, Apps, Corporation, Organization, Community, Social Networking or other web sites. 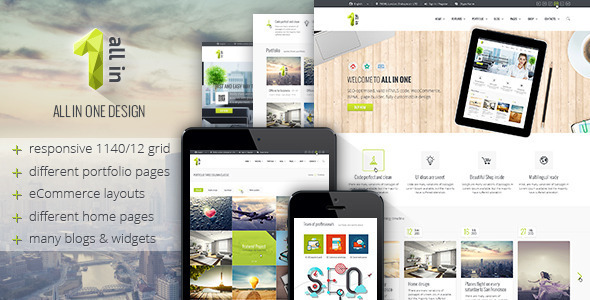 Template includes different home pages, portfolio, team, 404, blog, shop and others PSD pages. All in 1 designed for Wordpress, WooCommerce, Joomla, Drual CMS systems and eCommerce themes: Magento, OpenCart, PrestaShop and others. The PSD design contains of well-organized group of layers. It is easy to modify and customize everything. Check out the screenshots to see all pages and components. Logo and all icons are included and available for download. Please, feel free to post a comment and tell me what do you need more. I will try to update theme.